Why NRIs should invest in India? More and more investors from different countries are participating in various investment summits across the country held by the government. India has become an attractive investment destination on account of growing popularity of Indian leadership and the country’s improved foreign relations. More and more investors from different countries are participating in various investment summits across the country held by the government. These summits are opportunities for NRI and foreign investors to explore different investment avenues in the Indian stock market. While a large number of NRI and foreign investors have invested in India, some are still skeptical about this idea. Indian equity market gave splendid returns in 2017 after two lackluster years. Nifty 50 gave 28.6% return in 2017 compared to mere ~3% in 2016 and negative return of ~4% in 2015. In 2017, Mid-cap and Small-cap stocks outshined the Large-cap stocks. BSE Mid-cap and BSE Small-cap gave magnificent ~48% and ~60% returns respectively in 2017. 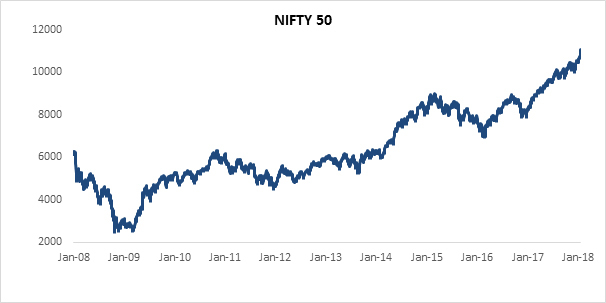 The market is trading at all-time high levels, but the long-term story of India is still intact due to strong macroeconomic factors and ongoing reforms. Below are a few factors that make India a favorable investment destination. Prime Minister Narendra Modi’s government is stable (majority government) and is largely touted as a reformist government. It has taken many decisions to make India business friendly. In 2017, Moody’s upgraded India’s Sovereign rating to Baa2 from Baa3 after a long haul of 13 years on the back of significant reforms and structural changes. India has also surged in the latest World Bank report on “the ease of doing business”— from the 130th position last year to the 100th, which has significantly boosted the confidence of investors. Since, the ruling Bharatiya Janata Party (BJP) has been winning most of the state elections, the presence of BJP will rise in the Upper House, which will support the government in passing bills subsequently. Besides, the rising popularity of PM Modi has also strengthened his chance to win the 2019 election. In 2017, India briefly lost the tag of the fastest growing economy in the world to China due to the shock of demonetization and GST transition. However, in 2018, the economy is expected to recover, as the dark clouds of demonetisation and hiccups of GST transition fade away. As per IMF estimates, India will become the fastest growing economy in the world outpacing China in 2019. IMF retained its India’ s GDP growth forecast of 6.7% and 7.4% in 2017 and 2018 respectively, and pegged 2019 GDP growth at 7.8%. IMF has forecasted a slowdown in China’s growth rate to 6.4% in 2019 from 6.6% in 2018 and 6.8% in 2017. The implementation of GST has transformed the old cumbersome taxation system into a simpler tax regime. 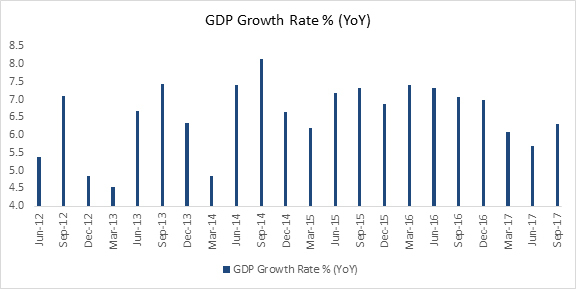 As per some estimates, GDP is expected to rise by ~2% after the implementation of GST. With the implementation of GST, companies in sectors where unorganized players had a high market share would gain market share, as the unorganized sector will come under the tax net and will lose the benefit of non-tax payments. Furthermore, the sectors like Pharma, FMCG, Consumer Durables, etc., with long supply chain spread across different states will save on logistics cost and inventory cost as moving goods will become much easier and efficient. In 2017, domestic MF’s net inflow in equity was highest in the last decade. They poured ~Rs1.15 lakh cr in equity in 2017 against ~Rs47,544cr in 2016. The inflows from domestic MF industry is expected to continue on the back of strong MF investments. 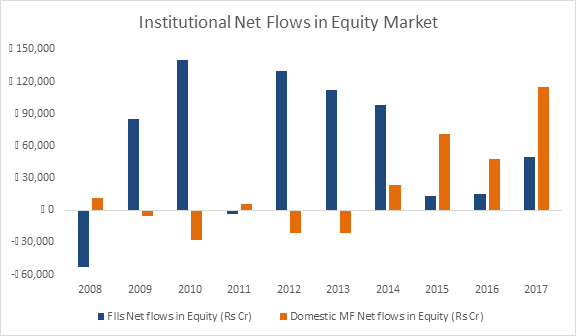 Besides, FII’s net inflows in equity market in 2017 also surpassed inflows in previous two years. FII's net inflows in equity market stood at ~Rs49,000cr in 2017 compared to ~Rs15,102cr in 2016 and ~Rs13,056cr in 2015. In the last couple of years, inflation had fallen significantly supported by the sharp decline in crude oil prices, fall in food inflation due to two good monsoons and efficient food management by the government. In 2017, the CPI inflation dropped to 1.2% in June 2017 from 11.5% in November 2013. 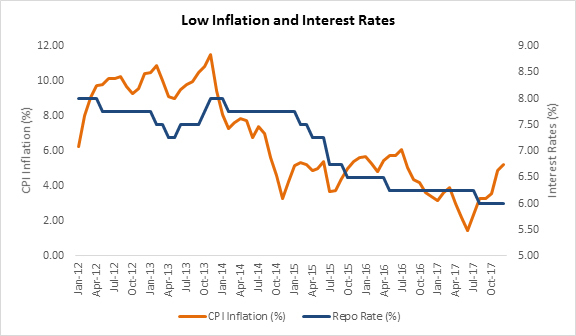 Besides, in the last five years RBI had also cut the policy rate (Repo rate) by 200bps supported by the controlled inflation. The above factors have helped NRI and foreign investors to benefit by investing in India. Also, with the ‘Make in India’ movement, the Government is putting in more efforts to attract more investors. This will surely impact the Indian economy in a positive manner. Since the broader market index and sector indices have given magnificent returns in 2017, investors should follow bottom-up approach to select stocks. Besides, investors should also focus on longevity, else they could lose money to make quick bucks.